Your resources. What resources do you have available? Fortunately, we have more French learning resources at our fingertips than ever before. Take advantage of as many resources as possible when making your study plan. The more interactive and fun, the better! Tandem learning is a technique where two people who want to learn each other’s languages take turns as teacher and as student. For example: if you meet for two hours, you can speak in French for one hour and then switch to English for the next hour so that you both get some practice. But be aware, just because someone is a native speaker does not mean they are a good teacher. This can still be a good option once you already know some French and just want to practice, but you must be prepared to teach your counterpart English. Tandems are free for both parties, but a significant time commitment. You have to get used to what in English we call the ‘w’ words: what, where, when, why, who, how: “quoi” , “où” , “qui” , “quand” , “pourquoi” , “comment”. You should get used to those at the beginning of your studies, as they are essential for making statements and asking questions. Try Google Translate to see what the corresponding words and structures are in French to questions you have in English. French is one of the most widely spoken languages ​​in the world with about 275 million speakers, 77 million of whom are native speakers. Indeed, apart consolidating relations with France – the fifth largest economy in the world and the second largest in Europe – this language opens the doors of countries on all continents since it is the official language in 29 countries and currently spoken in 8 other countries. Moreover, specialists project that in 2050 8% of the world’s population will be francophone! Another great resource that you may use for learning French quickly are podcast websites. This sites have lots of free podcasts. A podcast is simply an audio French lesson stored on an audio MP3 file. You may visit iTune’s website and download individual lessons directly to your PC, laptop or iPad. Additionally, a great place to discover online podcasts is our learn French by podcast page! By no means do I expect you to become the next linguistic mastermind. Simply put, the entire French language is composed of 37 sounds. Most of them exactly similar to English and others which have no place in our language. If you took a good listen to each phoneme (correct linguistic term for sounds that a language chooses), you’ll have a better understanding of French pronunciation. Check out this site and go through the sounds, all the exercises can be completed well within an hour. This step can be skipped until you have a more concrete understanding of the language, or not even accessed at all. I know many intermediate French speakers who know nothing about linguistics or French phonetics. Also, try reading this article which provides very useful pronunciation tips: French Phonetics. So how do French speakers talk so fast, anyway? Well, part of it is the language itself, as mentioned above. But also, not everything that’s being said is necessarily crucial. This little bits of linguistic fluff do not require a whole lot of thought to put together. I have seen people approach lists of vocabulary by looking at the French and seeing if they can understand the English; this is good to build your understanding of French, but not your speaking ability. From a practical standpoint, I’ve found that anytime I’m at a loss for the right French word, coating an English word in a heavy French accent is a surprisingly effective strategy. I remember during my first week in French class, I was trying to say that a certain French word exists in English but has a different meaning. The language is structurally similar to Danish, but with pronunciation more familiar to English speakers. Norwegian, like Swedish, uses a tonal “pitch accent” to distinguish homonyms, stressing either the first or second syllable of the word. It’s an easy concept to grasp: think “decent” and “descent” in English. I have a friend who went to Bordeaux for a few weeks and learned the basics to get around. She can successfully ask for directions, navigate her way through a train station, and order a glass of her favorite wine. According to her, she “speaks French,” which, of course, she does. But she’s far from fluent. 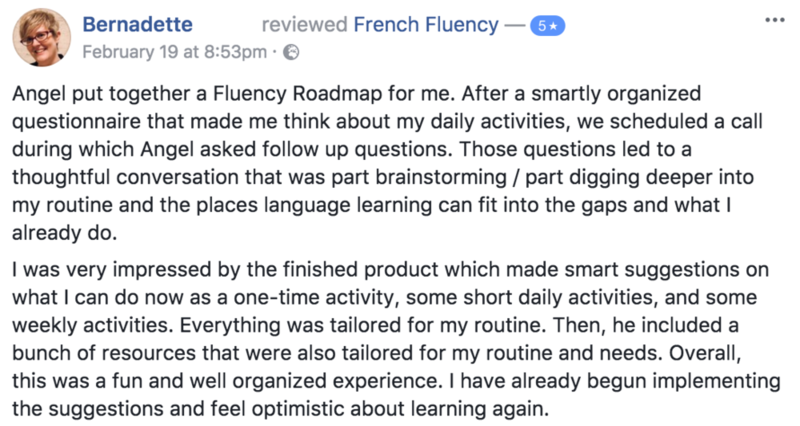 I hope my suggestions have helped and that you now have a better idea for how to learn French fast. 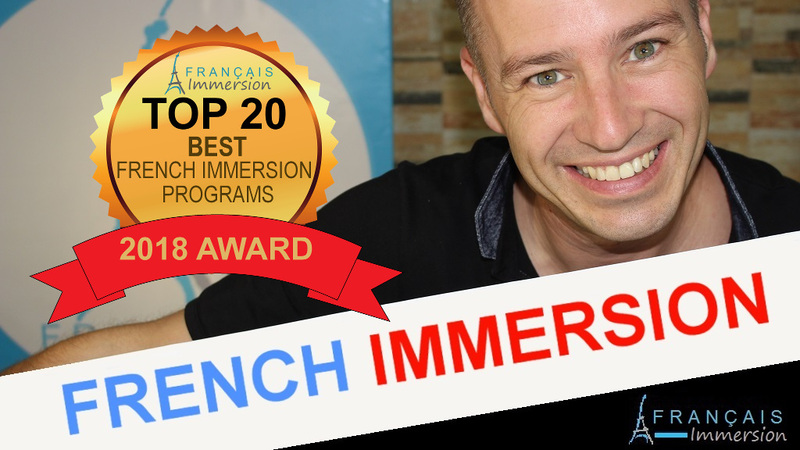 If you’d like more information here you can read my complete Rocket French Review and see how the online course can help you! It may be so. You may have “covered” it. But would you be able to remember all these words after… a week? Let along be able to use them in a conversation, nor deduct by yourself the grammar constructions that rules the sentences. Another method is “scriptorium,” developed by Alexander Arguelles, which involves writing sentences while speaking them out loud. The method I’m going to share with you now uses elements of both of those and adds video to the mix. In most classroom settings you will do a lot of writing, but less speaking. Speaking the language and immersing yourself in it is extremely important and a way to become more efficient at the language more quickly. This is why many students feel stuck in their French studies: with so many different French tools out there, they waltz from one video to the next, one free lesson to the next, but lack a logical and progressive approach. Many polyglots (folks who know more than one language) swear by the “shadowing” technique for learning a language quickly. Go outside and put your headphones on. While you play the language, walk briskly. As you’re walking repeat out loud and clearly what you’re hearing. Repeat, march, repeat. This will help you connect movement with the language and to retrain your focus so that you aren’t obsessing about memorization. If you’re getting frustrated regularly, reconsider your source material. It could be too challenging or not lively enough to hold your interest. If you would rather watch Amélie than a Rohmer film, now’s the time for honesty. If you would actually rather watch Rohmer but are in denial about being a film snob, now’s the time to own it. If the material doesn’t seem to be the problem, try cutting back on the number of sentences. French grammar, explained in a way you can actually understand. Many English speakers have not studied grammar in school, so the method shouldn’t expect them to know the difference between an adjective and an adverb, or what a direct object pronoun is. There are plenty of language courses that will teach you how to deal with specific situations, like asking for directions or ordering dinner. These situations are strictly controlled, though, and so are the resulting conversations. You will slowly get more and more used to the conditional and the subjunctive. Continue your enjoyable discovery of French, through listening and reading, and your confidence in this seemingly scary looking verb forms will gradually grow. Did you survive that with your sanity intact? Great! It may look like a lot to wrap your head around, but it’s actually not, especially in spoken French. In fact, the difference between written and spoken French is so vast that the first person singular, second person singular, third person singular, and third person plural forms of the verb manger are pronounced exactly the same despite having written forms that appear to vary substantially. Time for another video in Chinese! This is actually part of the summer project of improving many languages, and as such it is the first in a series of many interviews with natives of the languages in my list of 10. Yang Yang works as the Mandarin speaking presenter for the TV show “Hello Hollywood”. By grade three I could recite from memory the 16 French verbs that used the auxiliary verb “être”. But by grade 11 I still couldn’t speak or understand very well. Yet I eventually became fluent in French, graduated from a leading French university and have had a love affair with the language ever since. What is to be done? What advice do I have for the beginner? Don’t let the third “irregular” group scare you, though. Not only does it comprise the smallest of the three groups, it’s also considered to be a “closed-class,” meaning that all new verbs introduced into the French language are of the first two “regular” classes. 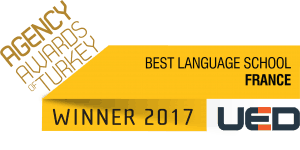 Covers all four aspects of language acquisition – listening, reading, writing and speaking – with fully interactive multimedia lessons. The speech recognition feature even helps you improve your pronunciation. This is especially true with speaking French. French includes sounds that don’t even exist in English. When you’ve only ever spoken one language, forming your lips and tongue into new shapes to make unfamiliar sounds can feel jarring, like hearing a wrong note in a well-known song. French is considered one of the most beautiful languages in the world. 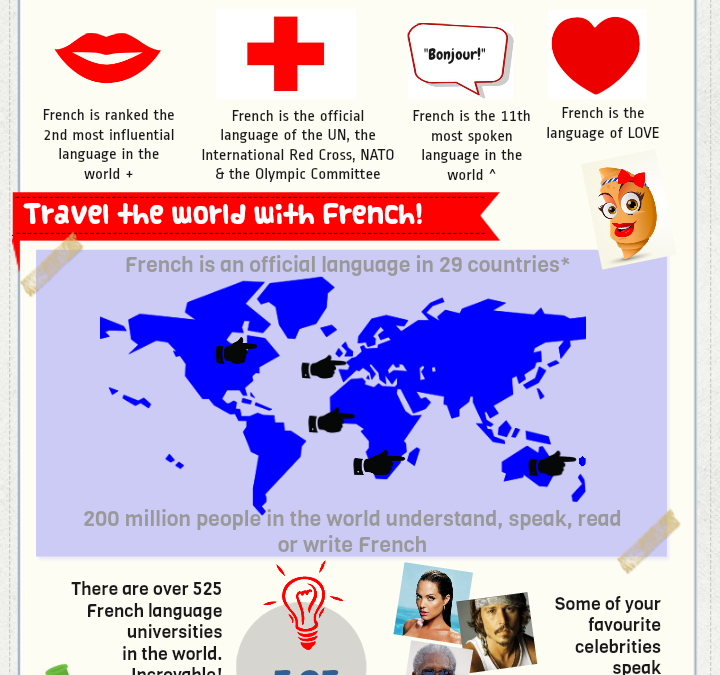 By learning French, you will have the ability to communicate with over 220 million extra people. Learning a language can be difficult, however. But with this article, you will be conversing in French in no time! 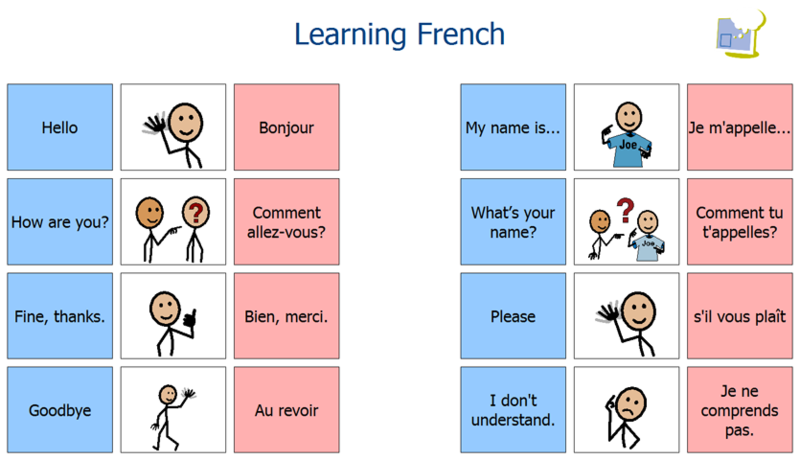 This article will give you a quick overview of the French language and how to learn it. Odds are, they’ll love it and want to help you. Don’t let fear get in your way. Interact in French as much as possible, and you’ll be amazed by the results. You can also find some great French learning hacks here to help you out along the way. Don’t forget to mimic natives! This may sound weird or silly, but if you hear something, say it out loud a few times – copying their intonation and pronunciation. My American friend would overhear French people talking and essentially mimic them, it works though because you’ll sound more and more like a native, fluent French person. Find a penpal, or skype buddy who speaks French as their native language. There are lots of programs over the internet or through colleges and local language schools that can set people up with people who speak French. Very soon you’ll discover that whereas in English verb forms don’t change much for person, in French every form of the verb changes, depending on the person, and tense and “mood”. We call these verb changes, the different conjugation forms of verbs. It’s very difficult to remember these conjugations. You can spend all kinds of time pouring over conjugation tables. In my experience it’s a very unsatisfying thing to do because you forget them. You might remember them for tomorrow’s test and then you forget them, so you constantly have to refer to them and see them in context. Learn to conjugate the verbs. Try to remember that verbs in french need to be conjugated according to their pronouns; there are three different conjugations, because there are three different kinds of verbs: verbs that end in -ir, -er, and -re. Memorize 30 words and phrases each day. In 90 days, you’ll have learned about 80% of the language. The most common words make up the greatest percent of interactions, so start by memorizing the most common words. Okay, so perhaps you’re thinking that, yes, you realize that English and French have many words in common, but there’s no way you’re ever going to be able to master that perfect accent your fantasy French husband/girlfriend/whatever has. Ah, but not so fast! If you are lost when you see “conjugate,” conjugating is this: the verb regarder means “to look,” in french. If you want to say “I am looking,” or “I look,” you write “Je regarde,” because when you take off the ending of the verb (which for this case is -er) in the Je form (Je means I), you replace it with “e.” Now, if you wish to say “They are looking,” or “We are looking,” you will need a different ending.